Some Polyethylene for landscape, greenhouses, "Blue" liner for pools... are as well. with 4 large goldfish (approximately 8-10" long). My swimming pool is being sandblasted to remove the fiberglass. When I came home, there was a film of dust (sand and fiberglass) floating on the pond. and added dechlorinator. I covered the pond with a tarp, but they are still sandblasting and will be continuing tomorrow. Should I change 1/3 of the pond water today and then another 1/3 tomorrow when they are done? Or put them in the bathtub with the pump until they are done? But I would still have water with particles floating in it I will try anything to save them. Thank you. ...Though it offered little solace to he who returned from the family picnic to discover that he had left the hose running in the goldfish pond (+/- 1000 gal., 12 full-grown common/comets plus 1 yearling) for about 8 hours (at about 5 gpm), on a Sunday night before a Monday holiday, at that. Ben, one of our 5year-olds and the alpha F, floated in the skimmer, and Mnemeth, the yearling (my wife may actually be from Pern, but I digress) was barely alive. She moved him into the 20-gallon setup indoors, but he quickly succumbed. The water was foamy. All we had handy was about 4 oz. of "Stress Coat," which only lists aloe as an ingredient, and almost all of a 26 oz. carton of Ammo Chips. This morning, to my relief, there is no foam and there are no more corpses in evidence, although I can only see 9. I'm not despairing for the other 2 yet, even though the water is quite clear. There are lots of places for a fish to hide in our pond if it wants to. The ones I see are behaving normally, swarming for a feeding. They can wait. Thanks. "Nobody's fault but mine," wrote the poet. Seriously, thanks for your condolences, Bob. It's the half-glass perspective. We are happy it was only four---we still haven't seen the other two, so they must be gone---and are happy that we still have three of our original six 5-year-olds along with five of their progeny and the one a friend gave us to take care of (whew!) We do have four more of the progeny that we moved indoors as fry. 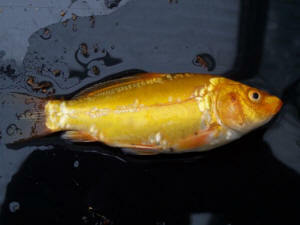 Being in a 20 gallon set-up, they're naturally a fraction of the size of the pond fish that are from the same spawn. Hi, I have a pond that has been in use for over a year now. the problem is that I didnt feel like working with it previously do to an illness that I have, so essentially it was left for my family to care for. Due to mosquito issues my family added a floating chlorine realizing device and several dosings of bleach last summer. I now wish to work with my pond and have tried adding some paradise fish to it. 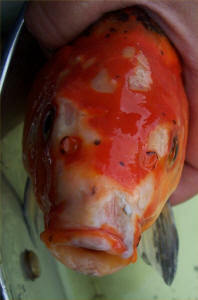 The paradise fish look horrible only minutes after being added and Im unable to locate them the next day. I have also been having some problems with duckweed and salvia that I have contributed to the sun before I noticed the problem with the fish. So heres the condition of the pond. Ammonia and nitrites are 0, I didnt test nitrate yet because it wouldnt account for the speed of deterioration in the fish that I have been noticing, and the API test is kind of a pain. PH is high, about 7.5-8, but again, while not ideal for the paradise fish, I dont see it killing them. The duckweed is mostly dead, but there are a few that are staying green, and there are a few aquatic insects currently alive at this time. Im thinking that there is some chemical in the water that is causing the fish death, and that the duckweed and insects are only surviving in small numbers. 99% of the duckweed is dead, and Im guessing that there should be a lot more insects then there are, but only a small number are surviving. As to whatever may have been released by the floating chlorine releasing device or something extra in the bleach I unfortunately dont know. Theres even a possibility that something else might have been added to the water last year, and forgotten about, so no one mentioned it. My plan was to use carbon to remove anything that might be left. filter for this purpose so if you have any suggestions on dosing I can probably accommodate it. I would eventually like to release some Xiphophorus birchmanni which would enjoy the high ph, but Im afraid to until I start seeing some better results with the paradise fish. Thank you for any help, Christian.